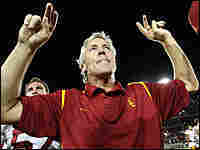 Pete Carroll, coach of the USC Trojans, celebrates after defeating the Stanford Cardinals Saturday at Stanford, Calif. Carroll earlier this month said the Bowl Championship Series "stinks." Twice this month, President-elect Barack Obama unflinchingly took sides in one of this country's most contentious debates — whether there should be a college football playoff. Absolutely, he said. "I don't know any serious fan of college football who has disagreed with me on this, so I'm going to throw my weight around a little bit. I think it's the right thing to do," Obama said on CBS' 60 Minutes Sunday. Will presidential weight be enough to change a much maligned, albeit lucrative college football system? Yahoo Sports columnist Dan Wetzel says Obama might have won by an even bigger margin if he had stumped for a college football playoff in places like Auburn, Ala. Wetzel says that people there hate the current system, called the BCS, or Bowl Championship Series, because it excluded the 2004 undefeated Auburn Tigers from the national championship game. 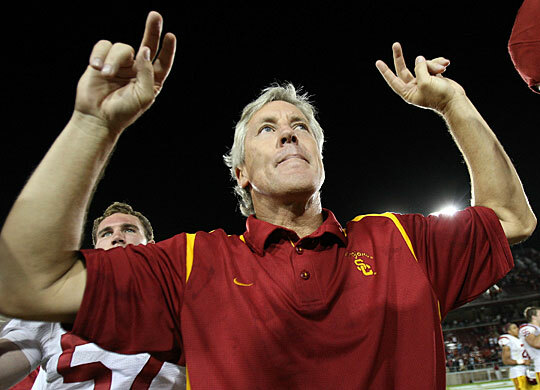 "If he'd just gotten up there like Bill Clinton and said, 'I feel your pain, Auburn fans. The BCS must go. We must tear down this BCS wall.' I honestly think if he had embraced this, he could've won 49 states. Alaska, with no college football teams and Gov. Sarah Palin, probably would've been impossible to topple, but everyone else would've gone his way." The BCS was created in 1998 as a way to isolate the top two teams so they could play for the championship. The teams are chosen using polls, computers and an assessment of how tough a team's schedule is. This format often has created a controversial ending to the season and an annual plea from a majority of college football fans: Please let us have a playoff — like nearly every other college and professional sport has. The coordinator of the BCS, John Swofford, responded to Obama's plea this week, saying, "We welcome a dialogue on what's best for college football ... and what's best is the current system." That system generates a huge amount of money for the major athletic conferences that make up the BCS. And Tuesday, the BCS announced a new four-year, $500 million TV deal with ESPN, which will go into effect when the current deal with Fox expires in 2011. "ESPN's deal represents a 50 percent increase over what Fox had been paying," which was an average of about $82.5 million a year, says John Ourand, a media reporter for SportsBusiness Journal and SportsBusiness Daily. ESPN obviously believes the current system is valuable enough to cough up $125 million a year. Wetzel of Yahoo Sports says networks would pay even more money with a post-season playoff. "A playoff system in college football would rival the Super Bowl and the NFL playoffs as the most watched and exciting sporting event in America," he says. The problem for playoff proponents, though, is that every weekend of the college football regular season right now is like a playoff. Just watch a lesser team upset a favorite: Fans storm the field; players on the losing team are shell-shocked, knowing they may not qualify for a prized BCS bowl game. In those moments, when the ratings and the attendance and the drama is high, the push for a playoff, even with a presidential nudge, gets overwhelmed by a feeling that college football is OK. And BCS officials everywhere smile.